WOW did I have a hard time with the colour challenge Megan gave us this week at PPC. I'm not really sure I like what I came up with because I'd never normally use these colours together. I hope you all have better luck making your creation this week!!! 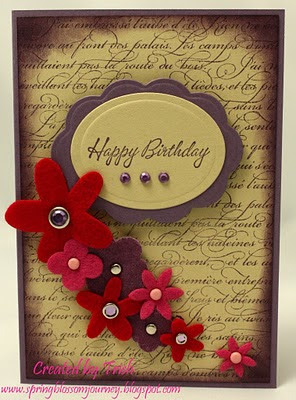 Nicely done, love the flowers....wow a tough color combo, but you made it very easy...love it! Wow! Gorgeous! I'm loving those flowers! I love this card. Those flowers are gorgeous and really stand out beautifully. You did good! Stunning creation with an unusual colour palette, it is so striking with the flowers. In honour of your hard work, I have left you a little something over at my blog. Wow! Your card is amazing. The colours are gorgeous. I love the colours! Love your layout and the flowers are gorgeous.